When Brad Pope returns to his boyhood hometown to settle a debt with his long-lost father, the 35-year-old psychologist becomes a prime murder suspect. Perched high on the east bank of the Suwannee River, the sleepy town of Whitecross, Florida is known for its natural crystal-clear springs and underwater caverns. Not murder. Until now. The psychologist's hopes of proving his innocence and reconnecting with his cantankerous Grandma Gigi are hindered by the surprise and horror surrounding his father's whereabouts and sinister secrets of the Women's Preservation Club (WPC). The six quirky "sisterfriends" in the club founded by Grandma Gigi-whom Brad expects to jabber about preparing Sunday's church bulletin or the next bake sale-start to look more like cold-blooded killers than church ladies. As Brad learns of more dead bodies, his suspicions sour into the clabbered taste of fear. What had the WPC planted in their welcome garden on the outskirts of Whitecross-Camellias or corpses? And what about Brad's nemesis, Voodoo Sally, an old black woman living in a dilapidated shack on the banks of the Suwannee River? She doles out her version of wisdom, "limestone gumption." But what else does she know about the murders in Whitecross? Reminiscent of "The Help" and "Fried Green Tomatoes," this offbeat, fast-paced mystery blends humor and dark plot, keeping you on the edge of your seat or making you fall out of it laughing as it witnesses beauty and brutality in a small Southern town, twisting, turning, and teasing to the surface one suspicion, one misunderstanding and one murder at a time. 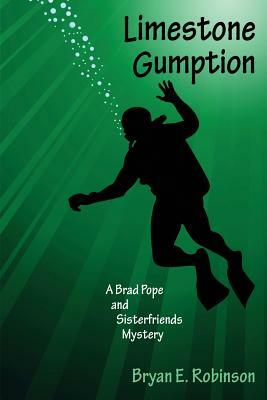 * * * * * Bryan E. Robinson's "Limestone Gumption" won the 2015 Silver IPPY Award and the Foreword Reviews' Bronze Award for best mystery of the year. Robinson is Coordinator of International Thriller Writers' Debut Author Forum, member of Mystery Writers of America, and author of 35 nonfiction books. He is a psychotherapist in private practice in Asheville, North Carolina, where he is working on the second book in the Brad Pope and Sisterfriends series, "She'll Be Killing Round the Mountain.